Log Mountain gives us a peek into the Frank Church River of No Return Wilderness. While discussing Thunderbolt Mountain (which sits a couple miles south) and what one can see from there, my good friend Michael mentioned climbing Log Mountain from the east. Intrigued, I put it on my ever-expanding List. Then with a bit more beta from Michael and a few web pages to compliment the guidebook (Idaho, A Climbing Guide) I gathered a group that changed several times but ended up just right: John, and Tom & Laurie. Many years ago, Tom had climbed Log Mountain from the other side following the route in his guide book, so he was excited to climb this side. The day before, I drove down to the Twilight Criterium with Bird, who was announcing (the beginning of this page tells who Bird is) so didn't get home until 1am. So it was pretty hard to pry myself out of bed at 5 to meet John in Cascade at 7. From there, drive past Warm Lake and turn down Johnson Creek. At around 10 miles, we drove right past the 410 road sign (we saw 'Ditch Creek' but were looking for Tom's RV). A few very scenic miles later we finally studied the map and retreated to find Tom now parked exactly where we were supposed to meet. Then a 10 mile drive on a good road to a surprisingly nice trailhead with camp spots and a concrete FS toilet. What dimension are we in? 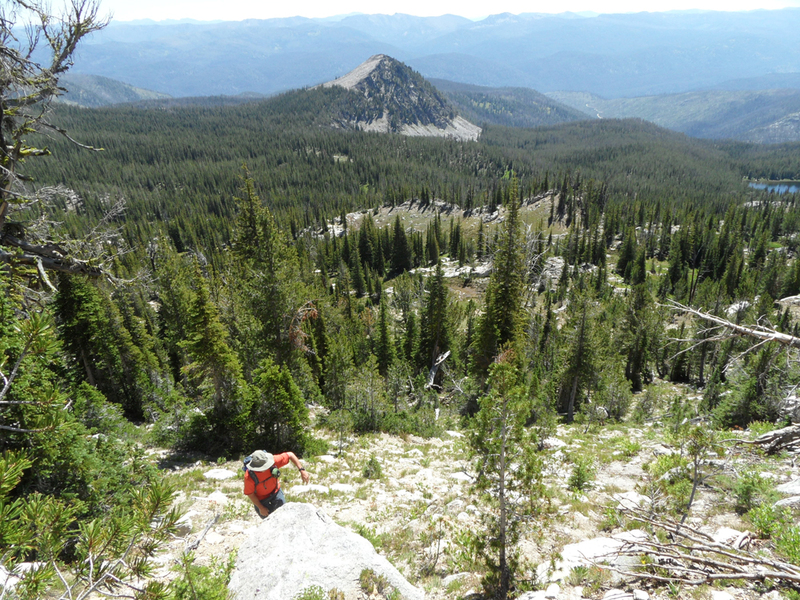 This approach to Rainbow Lake is part of the Idaho Centennial trail. 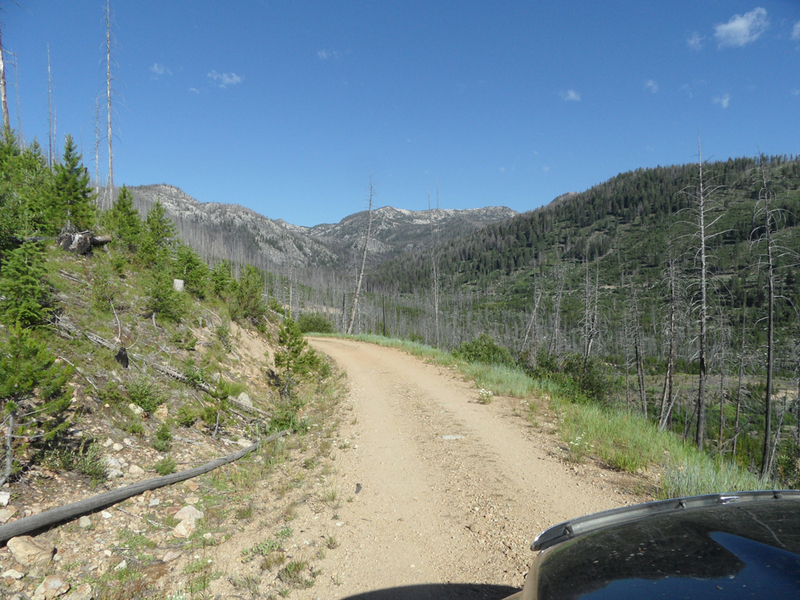 It starts off on an old road (with some deadfall), then swings off on its own to wander through some meadowy areas and lodgepole, some of which had been hopscotched by fire. By now, Laurie had had her daily dose of testosterone so elected to continue to Rainbow Lake solo while us guyz veered off on a spur trail for the peaks. 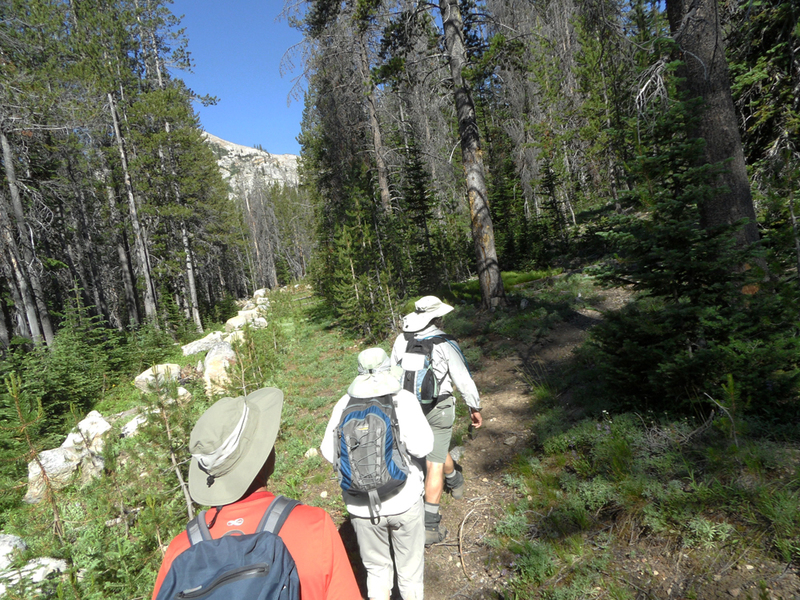 Initially the trail we followed was very spotty, but eventually turned into a nice path heading for Shell Rock Lake. Then a spur headed toward our first peak of the day, Log Mountain. When the trail disappeared, we continued following clearings and intermittent elk trails to jump from meadowy bench to meadowy bench. 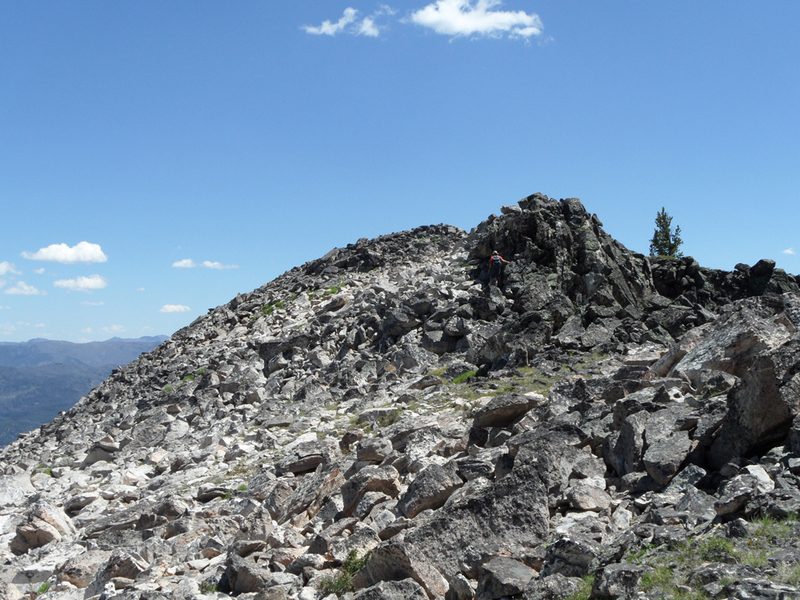 When we finally got to the head wall of the ridge, we barely had 500' left to climb. But that head wall makes you work. Reasonable footing, but continually steep. And increasing views. 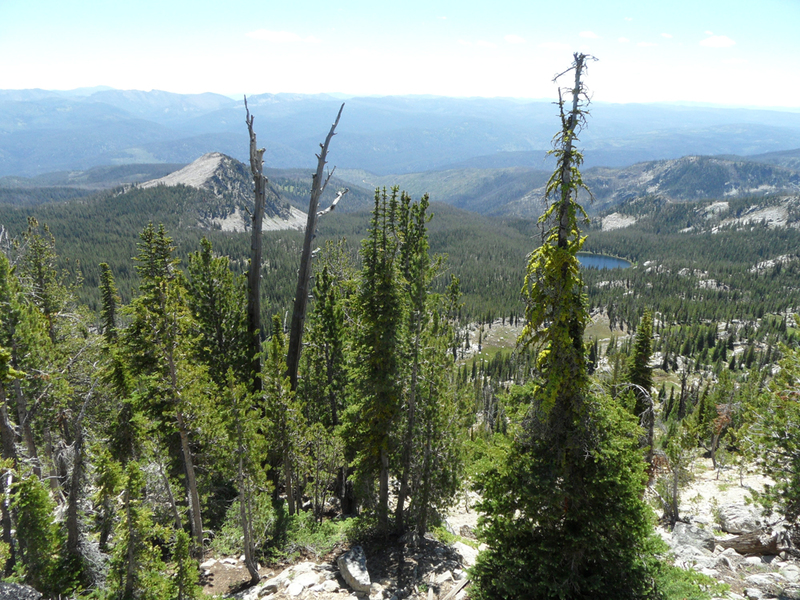 That's Shell Rock Peak and Shell Rock Lake on the far right. John is easily visible, and if you click you can also see Tom (in white, sort of a granite camo). The top of the ridge had some snow patches (from below they appeared to be 20' tall, but ended up just barely knee high). Views, views, views. Log Mountain is the high point on a long ridge running between and parallel to the South Fork of the Salmon and Johnson Creek. As such, there's nothing to get in the way. I was madly naming peaks and ranges: Sawtooths. Wallowas. The Twins and White mountain? I could definitely see Square Top, Blackmare, and Thunderbolt. I thought I spotted Jughandle. 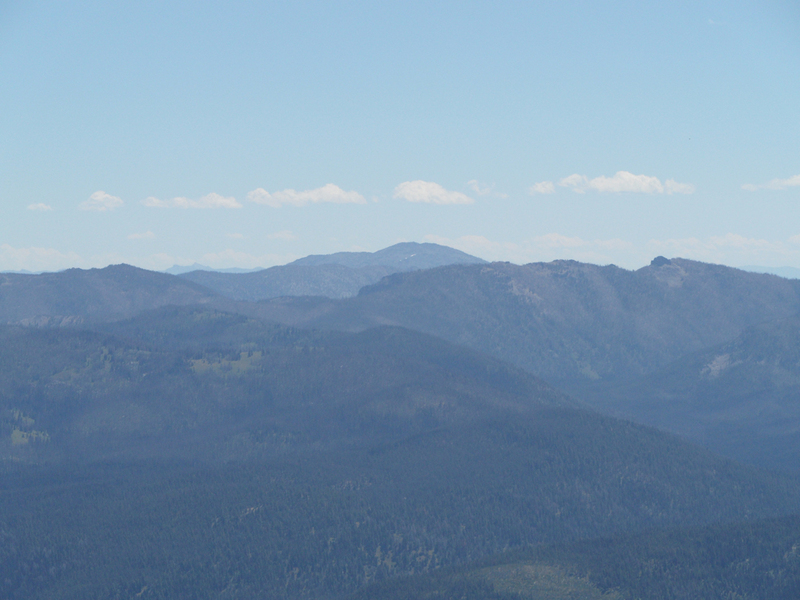 The rest of the Lick Creek peaks confused me because there are so many and I had never seen this view before. And in the distance, was that the Lost Rivers? 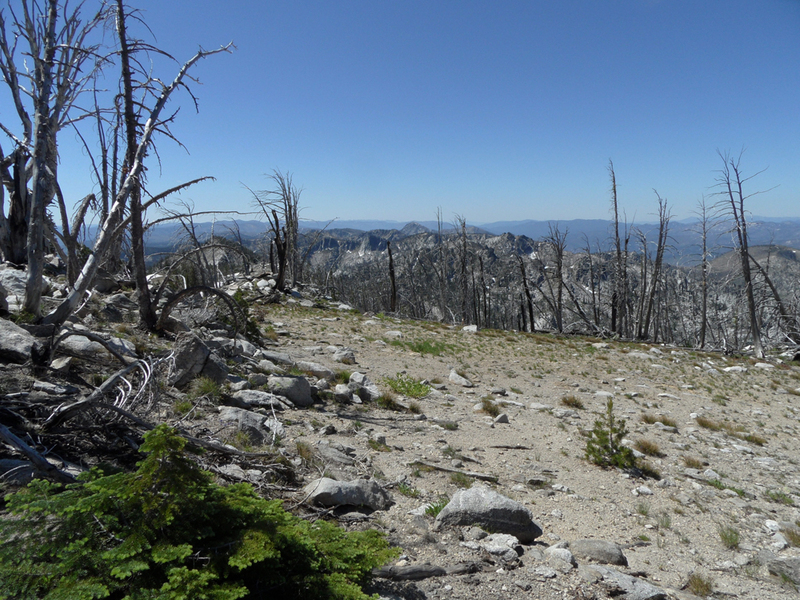 All around an absolutely HUGE swath of Idaho wildness. You're staring right into the Frank Church, and its size is impressive. We got Tom to name a few of the more impressive peaks, such as Big Baldy. I need to go there! 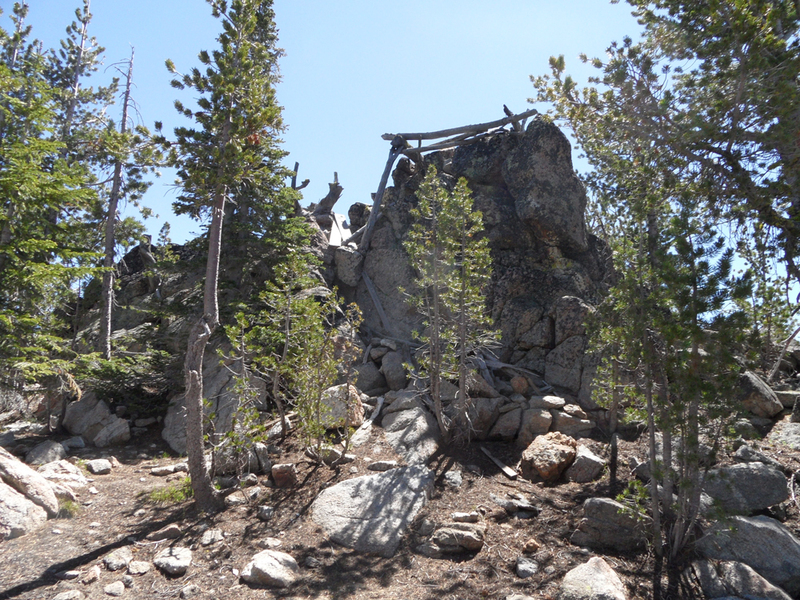 The summit is a broad ridge capped by a little rock tower. Very cool. 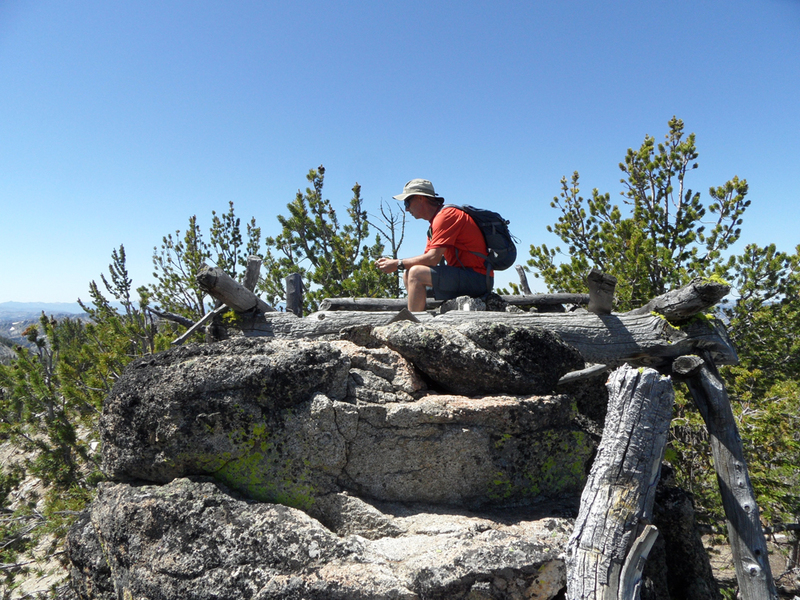 And as Tom had told us (he had climbed Log from the est years ago), the remnants of an old platform lookout. We clambered up onto the tiny summit, which was just barely big enough for the three of us to sit. So sit we did, while we enjoyed perfect weather and a somewhat leisurely lunch. But Tom realized that he had all the food (turned out to not be true) and bug spray (the bugs were out lower, but not so much up here), so with concern for his wife's well-being, we cut our summit sojourn short and headed off for our next peak, which was really a shortcut anyway. We dropped directly off the ridge and stumbled onto our old tracks. Then the trail. And finally started up the steep approach to Shell Rock. 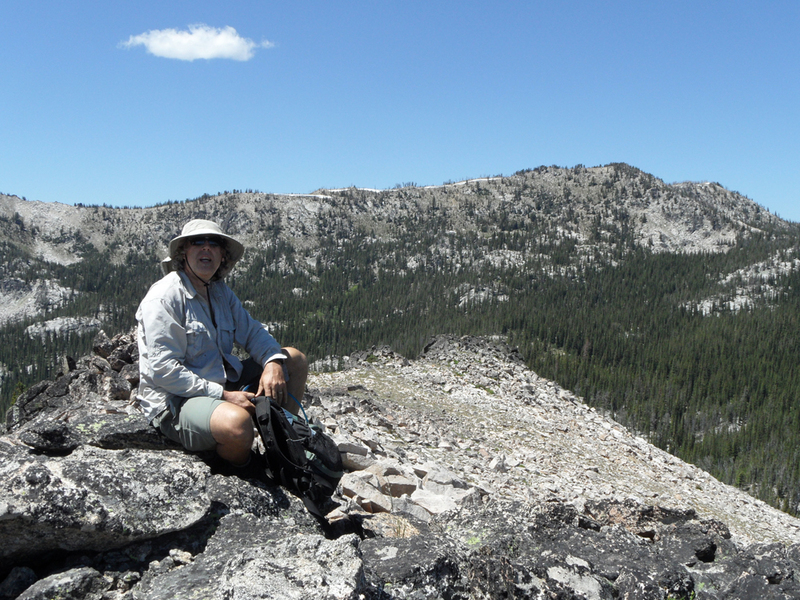 The top of Shell Rock is blocky granite, but again the light breeze kept us cool and the bugs at bay. John is scrambling the rocks if you click the picture. Here's Tom on Shell Rock with Log in the background. We scrambled off the shoulder of Shell Rock closest to the trailhead, then bushwhacked a bit to find the trail back to the car. Easy and straightforward. 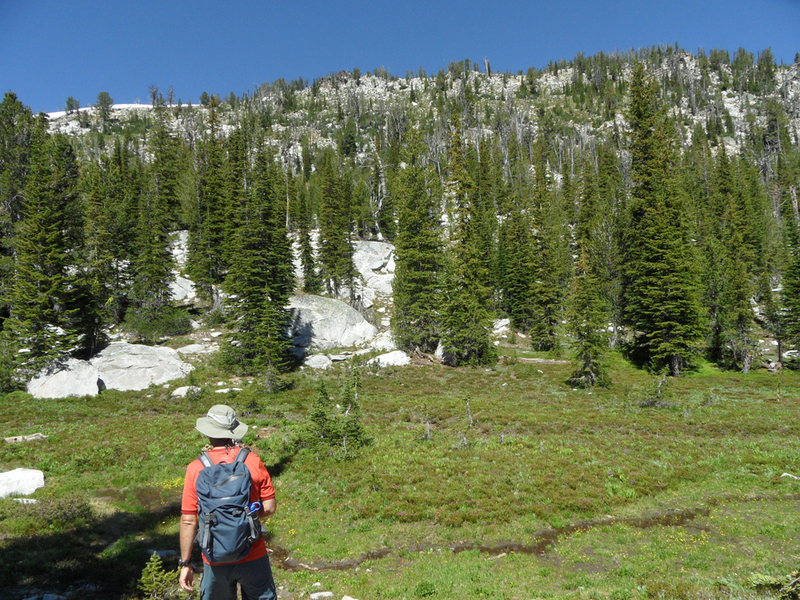 Laurie reported that Rainbow Lake was big, somewhat swampy, and loaded with wildflowers. And bugs. When we got back down to Johnson Creek, John and I headed back to his car in Cascade, while Tom and Laurie headed north down Johnson Creek in the RV for more adventurous. Lucky! We found this to be a fun, easy, and scenic hike. It's a bit of drive to get back in there, but all very scenic and totally worthwhile.